Testing electrical current flow, which is measured in amperage, is an important part of determining the flow of power. Power is calculated by multiplying voltage and current. Since voltage is usually constant depending on the source, measuring current will help determine how much power is being used in a particular application. There are two ways to measure current: breaking the circuit and inserting a multimeter, or by using a clamp-on meter. As most multimeters are capable of measuring only small amounts of current, it is recommended that you use a clamp-type meter. 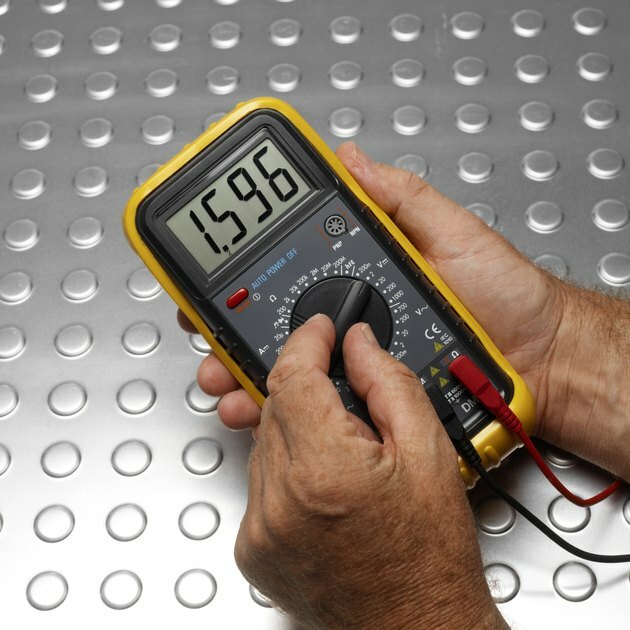 Small amounts of current may be tested with a simple multimeter. Isolate the wire in wire you wish to measure the current flow. If this is an AC (alternating current) cable, you will need to remove some of the shielding and isolate one of the power lines, because with alternating current, measuring both wires will allow each to cancel the other out, giving you a reading of zero amps. Select the appropriate setting on your meter to measure either AC or DC current. This will usually be indicated with an "A" and either a horizontal line with a dashed line under it for DC (direct current), or an "A" with a sine wave (~) next to it for AC. Set the dial to the highest possible maximum setting. Turn it down until you get a clear and accurate reading on the display screen of the meter, which detects the amount of magnetic field created through the wire by the flow of electricity. Brandy Alexander began writing professionally in 1993. She has years of experience as a professional of the English language employed with the "Cape Times" and "The Mercury." Alexander holds a master's degree in English literature from Stellenbosch University in South Africa.